I think Mr Hammerbacher is being oversimplistic. This was probably taken out of context to “explain” the reason he is leaving Facebook, which is likely to be more complex than just this comment. I doubt he only sees platforms such as Facebook as only concentrating on Ad revenue ; these platforms have allowed whole countries to have peaceful revolutions. Facebook, Twitter and even Google, aside from being profitable marketing machines, have created tools which inform and allow people to organize themselves through grassroot movements. It is the same as saying that because Fox news misinforms the population and advertises, journalists in general are only interested in ratings. I think a blanket statement like this is untrue. Many gray areas exist. Think about the implications of what internet tools have made possible in the last 10 years: Democratization of political thought, open source programming and advancement and the sharing of scientific knowledge regardless of distance. Furthermore, and to be “Facebook specific” they did not begin advertising until the platform was already functioning as a powerful communication tool. Yes they are monetizing through ads, but they are less intrusive than what we are normally used to through TV, print and any other form of media. The trick is to keep a balance between advertising and the usefulness of a platform. I think we can all agree that Facebook ads are not particularly aggressive in nature and are clearly distinguishable from the content you go to Facebook for. The fact that Web Analysts like me use “user behavior” to analyze improvements in a system is not necessarily bad. It isn’t solely done to increase “ad clicks” as much as to make improvements on the user experience: Google for example constantly improves its search algorithm, Facebook constantly uses data to improve user interaction and experience, and twitter as well. These improvements help us shape the future of technology and communication tools by defining how users interact with them. The fact that it is currently motivated by an advertising platform does not necessarily mean it is bad as long as that delicate balance of Ads/usefulness of the application is maintained. If advertising is abused, users will abandon a platform (ie. Myspace & Digg). 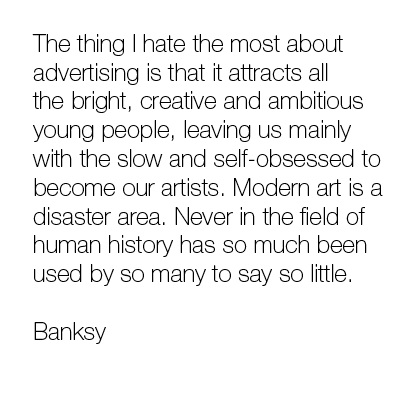 On the other hand too little advertising and a platform can quickly become too expensive to maintain. What happens then? Platforms who abuse advertising die off… those who find and maintain that delicate balance are the ones who survive. That’s a valid point. But you can’t deny that it could be replaced with “Many great minds of our generation.” Analyzing complex data takes a lot of brains to do well. The problem isn’t what the minds are doing. The problem is what’s suffering because of what they’re no longer available to do. Hammerbacher’s argument is pretty weak – Great mathematical minds often end up on Wall Street, some of the world’s best engineers are part of the military industrial complex, potentially great philosophers end up prescribing drugs as Psychiatrists… the best minds of every generation have rarely been given an unequal opportunity to flourish. But by definition these people are intelligent, and so it’s hardly the system’s fault that smart people, making fully informed decisions, end up taking selfish routes; it’s human nature.